We continue to eat our way through the best sweet corn of the season this week with these soft shell tacos. 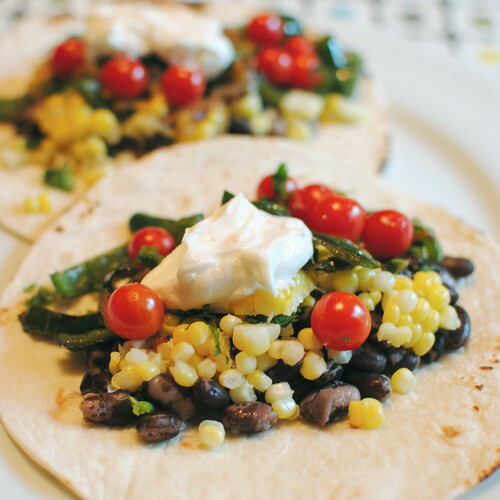 We love sweet corn in black bean chili, so it only makes sense we'd like them together in tacos too. These were messy, messy tacos because of the amount of filling, but I loved the way they all worked together with different textures and flavors. Crisp corn meets soft beans and cream sour cream. Spicy peppers and onions play against sweet corn and cherry tomatoes. A big plus was the bulk of the items in these tacos are currently in season and were purchased at the farmers market. Fresh summer eating at its best. There is really no recipe here, but I'll tell you how much we used of everything and how we prepared them. 8 soft taco shells, heated in the microwave or on a grill. Messy tacos are always the best! I love the combo here. more corn--i love it! this is the best yet, as far as i'm concerned. corn and black beans are perfect together! We're eating our way through some sweet corn as well! These tacos look so great. Good idea! I love the idea for heating the shells on the grill. Any tips for how to do this? Village Woman - Just throw the tortilla on the grate for a few minutes or a few seconds, depending on how hot your grill is. You'll see it will start to curl up a bit & get a little brown. Flip it & do the other side. Keep an eye on them because they can burn quickly. We do the same thing right on one of the burners of our gas stove.